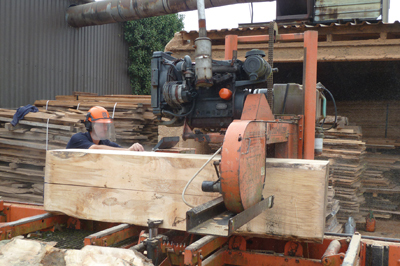 Wood-Mizer are the world's leading producer of thin kerf band sawmills and ancillary wood processing equipment. 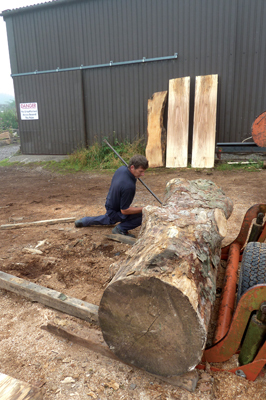 I paid a visit to Steve Levett, who can be hired, with his Wood-Mizer, to help you turn trunks into workable pieces. 1. The beauty of the Wood-Mizer - effectively an easily adjustable horizontal bandsaw with extended table - is that for most jobs it only takes one person to operate it. 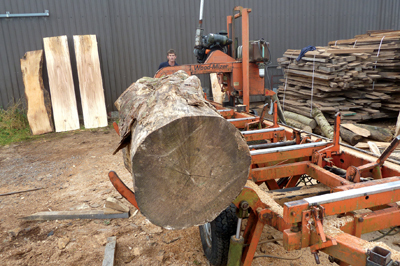 The most labour intensive part is shifting the log onto the hydraulic lifting forks. Using a long enough bar reduces the grunt necessary for this part, but once the log is in place the machine is capable of doing almost everything else without much manual physical input at all. This tree trunk was over 3m in length and over 1m in diameter. 2. Once the log is in position the hydraulic lift shifts the log onto the platform. Note the upright anti-roll-off bars on the right-hand side of the bed; this can be raised or lowered as required. 3. 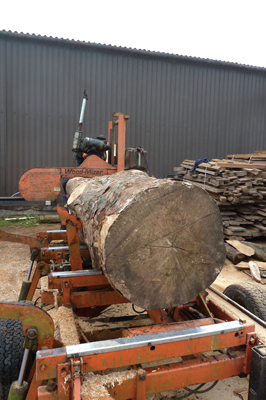 Once the log is on the bed, its position can be manipulated by hydraulic arms seen on the left-hand side. These arc in and also rise so the tip teeth lock into the wood and roll the log around as required. 4. 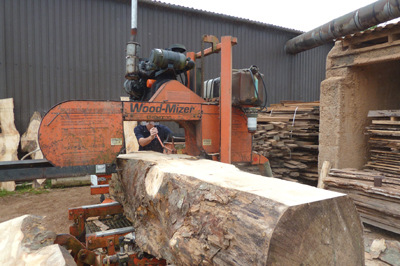 The bandsaw can be set to depth easily and in the case of this log it took a few thin cuts on one top face so that it could later be rolled over onto a flat face, providing a stable platform on which to make further cuts. 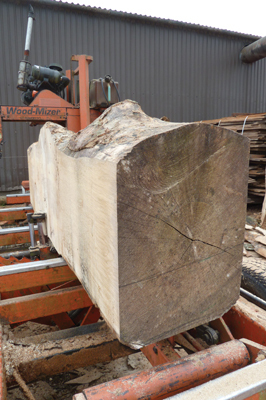 Of course each frame has a fixed maximum width of timber that can be passed through it; in this instance another skim cut was made on a side so that it could be processed easily. The cutting is very quick and so clean and easy to control. The hydraulic toothed arm seen in picture three makes the whole process simple. 5. The trunk was then ready for through-cut planking. I requested a 200mm thick section for some turning projects, but others required some 50, 75 and 100mm planks too. Of course by rotating the trunk around you can get the grain orientation and specific sections required. 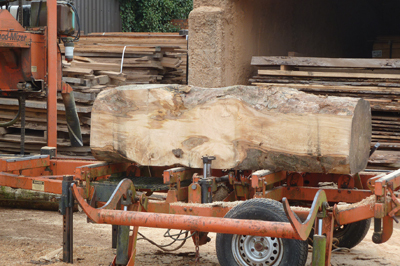 The tree was rotated a few times in this process to optimise the planking and grain pattern. Note on the left-hand side of the bed there is a black hydraulic clamp, this is used to hold the wood up against the uprights on the right-hand side. Security, safety and ease of use - all excellent points with this unit. 6. Now for the big sections of timber. It took less than a minute for the arm to pass through the wood and there was no hint of it baulking at any point of any of the cuts made on the trunk. Again the trunk was shifted round so we ended up with straight sides and faces on the slabs of wood required. Again, note the clamp holding the wood securely. 8. 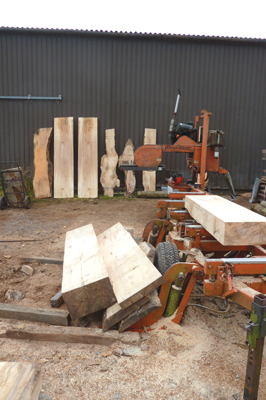 ... but this whole trunk took less than 35 minutes to process including man-handling the wood onto the hydraulic forks; it is quick and very easy to use. Steve Levett, who owns and operates this unit, uses it as part of his every-day business, but has also realised that others might need such a machine once in a while, and hires himself complete with the Wood-Mizer out for the day, so landowners, clubs, woodland owners, etc. can hire a package where he will turn up and convert trees to requested sizes. 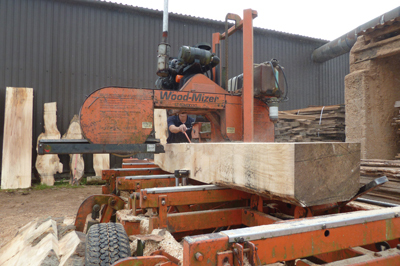 The machines are easy to use and invaluable when working within the wood industry when converting trees to usable planks and easy-to-manage sizes.